AirPlay can be controlled through iOS apps or the iOS Control Center, or through Apple’s digital assistant, Siri. “It makes the Apple controlled home audio offering a little more flexible and less susceptible to the drawbacks of having a mobile device responsible for the download and streaming of audio to the speakers around a home,” he told TechNewsWorld. 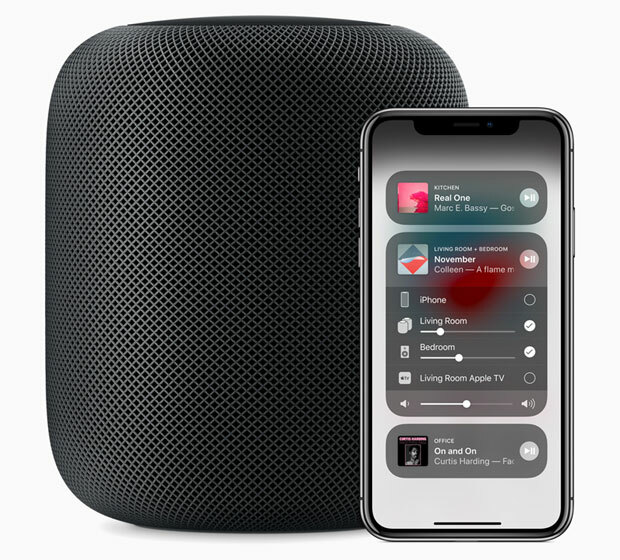 The addition of multiroom functionality for the HomePod advances Apple’s strategy for the product, said Dina Abdelrazik, research analyst at Parks Associates. While it’s a natural step for Apple, it may not be a natural step for making headway in the market. “Apple has built one hell of a speaker, but it’s for a market that wants one hell of a digital assistant,” observed Rob Enderle, principal analyst at the Enderle Group. Despite the improvements in the HomePod experience in the latest version of iOS, Apple’s smart speaker has some major challenges in front of it. Because HomePod came late to the smart speaker party, its major competitors — Amazon with its Echo, and Google with is Home — already have penetrated the market deeply. What’s more, it’s trailing its rivals in the software department. “The HomePod’s challenge is Siri — an assistant that falls behind competing assistants in cognitive abilities and feature set,” Parks’ Abdelrazik said. “Amazon and Google want you to access their agents from a wide variety of third-party products,” noted Ross Rubin, principal analyst at Reticle Research. “That’s not Apple’s strategy so far, but we may hear more about it in couple of weeks at the Apple developer’s conference,” he told TechNewsWorld. Even taking into account the HomePod’s premium pricing and high-end audio focus, demand has been lighter than Apple hoped for, ABI’s Collins said. “As long as the HomePod is so tightly integrated with Apple hardware and streaming services and priced higher than rival smart-home, voice-controlled front-ends, the device will stay at the margins of the wider smart home market,” he added. “Lacking full smart speaker features, the HomePod is firmly focused on people in the Apple ecosystems that want a compact speaker and didn’t already own a Sonos speaker system,” said Kevin Krewell, principal analyst at Tirias Research. “It’s targeting a smaller serviceable market than Google Home and Amazon Alexa,” he told TechNewsWorld. “In those terms, Apple has the most successful home speaker in the market today,” maintained Tim Bajarin, president of Creative Strategies. “Price will always be a challenge, but if quality increases and they add more functionality, it will hold its own and be a major revenue source to Apple’s bottom line,” he told TechNewsWorld. “Apple is the only player that consistently enjoys cross-platform loyalty,” Parks’ Abdelrazik said. Apple also said Tuesday that HomePod would be available in Canada, France and Germany starting June 18.